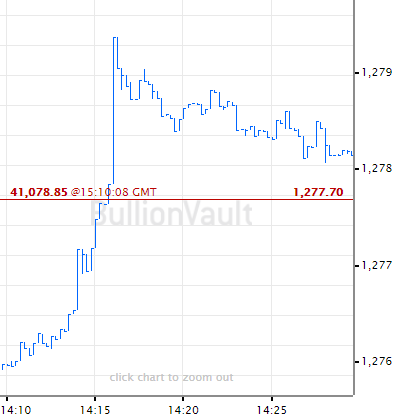 GOLD TRADING in the world's central wholesale market of London rose to a four-year high by volume and value in 2017, but physical flows of bullion bars through the UK fell by one quarter, down for the first year since 2014, writes Adrian Ash at BullionVault. 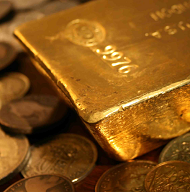 Data reported by industry body the London Bullion Market Association (LBMA) suggest that the quantity of gold trades settled through the city's five precious-metal clearing banks rose 6.1% last year to more than 5.3 billion ounces. Rising 7.0% by value to $6.7 trillion – also the highest annual total since 2013 – that turnover nearly matched best estimates for the sum total of all the gold ever mined in history. 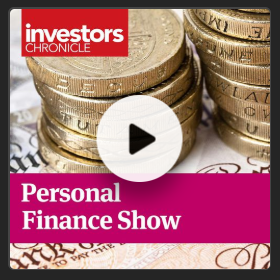 In contrast to City of London trading, physical gold flows through the UK fell last year, down 24.6% overall by value and dropping 30.2% in total Pound Sterling terms from 2016's three-year high according to the latest data from tax-revenue and customs agency HMRC. But with zero gold-mine output – and with next-to-no household demand compared with the leading consumer nations – that drop, the first since 2014, still saw the UK take in the world's fourth heaviest flow of bullion imports behind the refining center of Switzerland and top buyers China and India, while sending out the second-heaviest flow of gold bars after Switzerland. 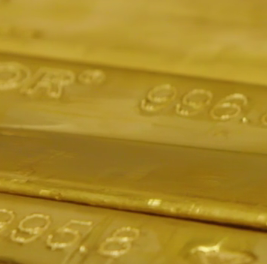 Destined almost entirely for secure storage in London's specialist bullion bar vaults, gross UK gold imports totaled 851 tonnes in 2017, down 41.3% from 2016's series record. Gross outflows rose 9.7% to 445 tonnes, barely half the previous half-decade's annual average. 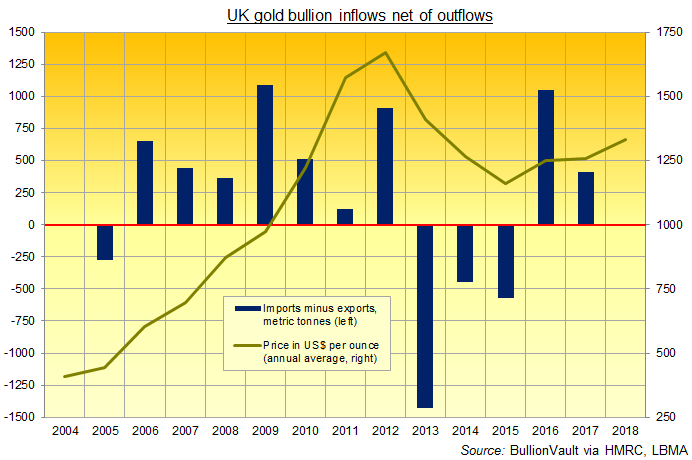 Together that left net UK gold inflows in 2017 just below 407 tonnes, down 61.1% from 2016's seven-year record. 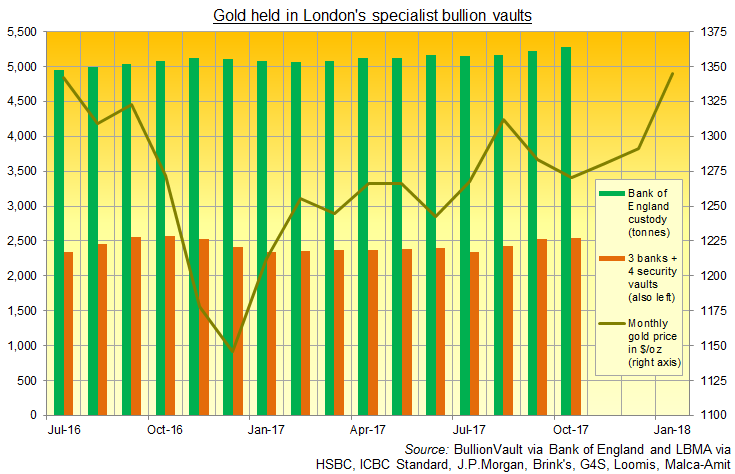 Separate data reported by London's eight specialist bullion custodians say their facilities held 7,827 tonnes of market-ready gold bars at end-October – the latest figure available, with an annual increase of 2.2% – plus almost 1.1 billion ounces of silver. Those London bullion holdings would equate to some two years and 5 months of global gold mine output, and around 15 months of global silver mine production. Two-thirds of the gold stored in London's accredited wholesale facilities was held at the Bank of England, primarily for other central banks wanting proximity to the London wholesale market but also for those five commercial banks offering to clear bullion deals in the City. 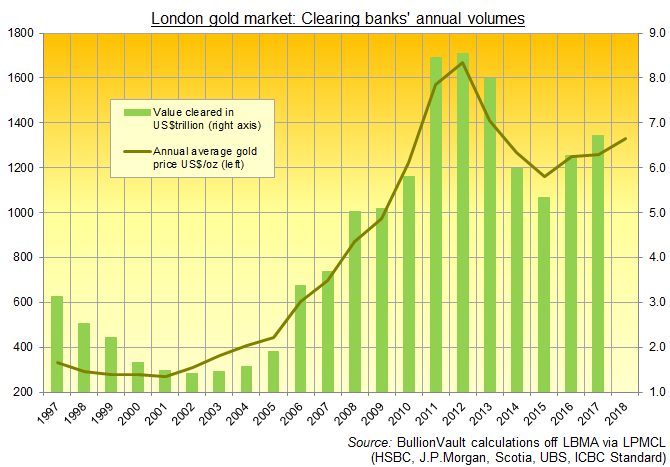 By weight, the gold stored in the UK's central-bank vaults – first opened in 1732 as London became the center of world gold trading, then moved two years later beneath the current Threadneedle Street site and rebuilt in their current form in the 1930s – grew 4.0% year-over-year in October to 5,282 tonnes, the largest total since August 2014 on the Bank's own data series. Over the last 10 years, net imports of gold into the UK have totalled 2,003 tonnes on the HMRC data. That equates to 6.8% of the last decade's global gold mining output. As a proportion of all UK trade in goods, across the last decade gold has accounted for more 5.2% of both total imports and exports, regularly putting it in the top 5 largest traded items each month. With barely one year until Brexit, when the UK will leave the European Union in March 2019, other EU states have accounted for 49.0% of all exports and 50.5% of all imports since 2008. For the UK's huge flows of gold however, those figures fall to 5.4% and 1.5% across the last decade.